There are many reasons why canines lose hair behind or around their ears. Severe and prolonged hair loss can be a serious problem, and should be evaluated by a veterinarian. Canines occasionally scratch their ears or shake their heads; this behavior is quite normal and should not be cause for alarm. It is the continual or obsessive scratching and shaking of the head that signals cause for concern. Simple conditions are easily remedied, but can become very serious if left untreated. Ear mites (sarcoptic mange), also known as canine scabies (another microscopic mite), ring worm, fleas, ticks and other biting insects can all cause extreme damage if left untreated. Some of these parasites are passed from host to host, so it is important to treat all of your canines and felines. Severe skin irritation, hair loss and ear infections can result. You may also notice crustiness and discharge from the ear. This is a clear sign of infection. Canines, like people, can have allergies and experience allergic reactions that sometimes affect their ears. 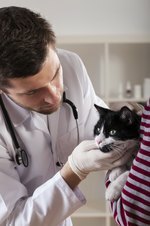 Your pet can be allergic to any number of things: insects, different types of food or snacks, shampoo, plant life, chemicals in and around your home or medication it may be taking. If you have recently fed your dog something different you should switch back to what was given previously. In most cases of allergic reaction, it is possible to determine the source by using the method of elimination. Hormonal disorders, autoimmune and immune-related skin disease, skin margin dermatitis, cancer, breed-specific problems, bacterial and yeast infection or alopecia are problems that can result in hair loss in canines around the ears. All of these conditions can be very serious if left untreated for any amount of time. Plus, your canine is probably experiencing agony if it has one of these conditions; it is humane to seek the professional opinion and services of your vet immediately. Canines lose hair on a continuous basis throughout the year. In parts of the country where seasons change canines shed their winter coat, and during this time there is often a considerable amount of hair loss. If your dog is experiencing uniform hair loss rather than in patches, the shedding is normal. Certain breeds of canine have thin coats of fur due to their specific breed, and some breeds have no hair. Sometimes canines lose hair due to their age. If you are uncertain about the reason for hair loss, consult your vet.